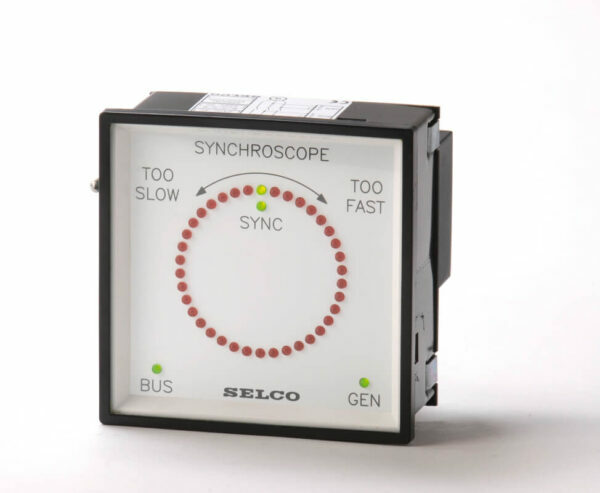 The Synchroscope M8100 provides illuminated indication of the phase and frequency difference between voltages on two separate AC systems, e.g. a generator and a busbar. The M8100 will also indicate whether or not the two systems are on voltage. The M8100 Synchroscope provides illuminated indication of the frequency and phase deviation between voltages on two separate AC systems (e.g. a generator and a busbar). The M8100 will also indicate whether or not the two systems are live. A moving light dot indicates the frequency deviation. The magnitude of the frequency deviation is indicated by the speed and direction of the movement. Clockwise movement indicates that the frequency is too high on the incoming system. Counter clockwise movement indicates that the frequency is too low. A steady light dot at 6 o’clock position indicates zero frequency deviation and 180 degrees phase deviation. Exact synchronization. frequency and phase accordance is achieved when the light dot is steady at the 12 o’clock position (when the green LEDs ignite). The M8100 scale is made up from 38 bright red LEDs. The resolution provided by the 38 LEDs is almost as fine as a pointer synchroscope, however the LED based design is far better at withstanding environmental influence from vibration, temperature and humidity.